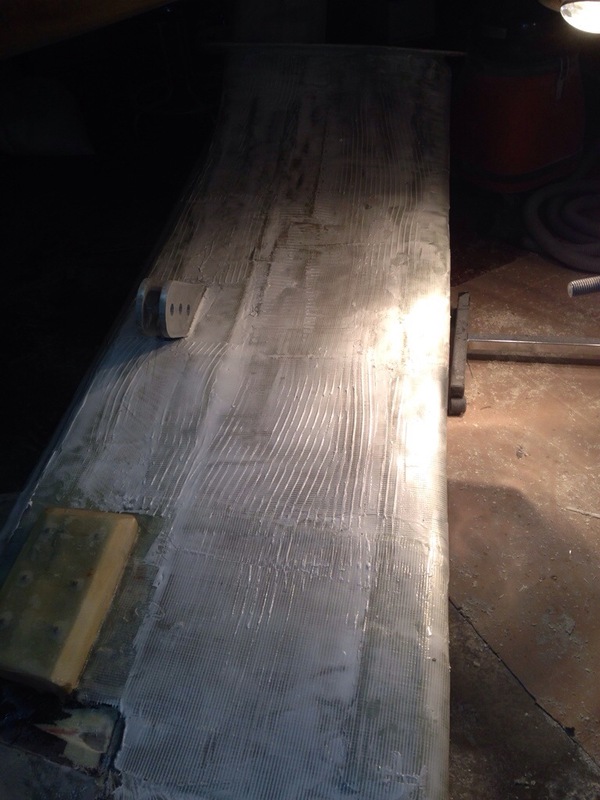 But really we need to post-cure the epoxy in the beams and steering parts, so we need a big oven to reach and hold 160 degrees (F) for 2-3 hours per session. 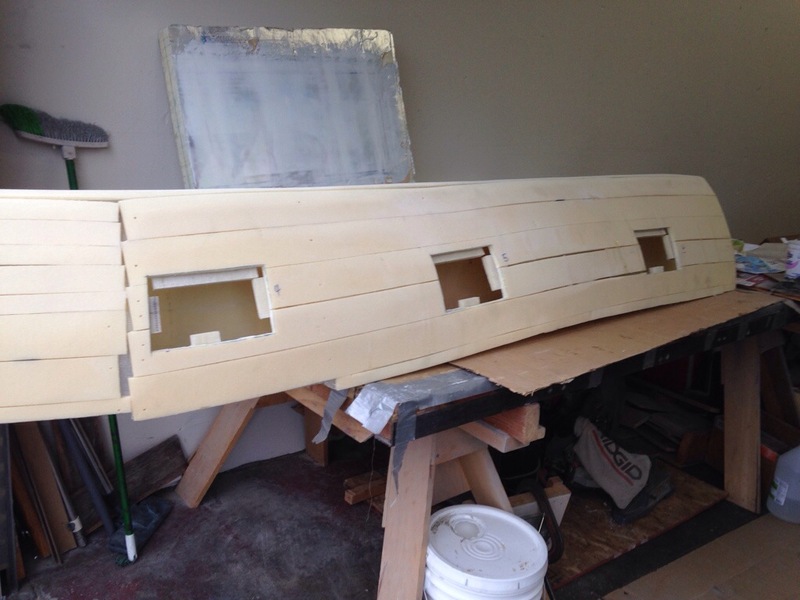 Made this from Sheetrock and ripped 2x4s, just big enough to house one forward beam resting on its furniture dolly. Pulled the top on, and it started working right away, but the fan-aided space heater hit a safety kill setting at about 95 degrees. So tomorrow we’ll follow Gordie Nash’s advice and find a cheap baseboard wall heater at Home Depot. And perhaps have to take some license pulling out any safety settings if it has a brain. 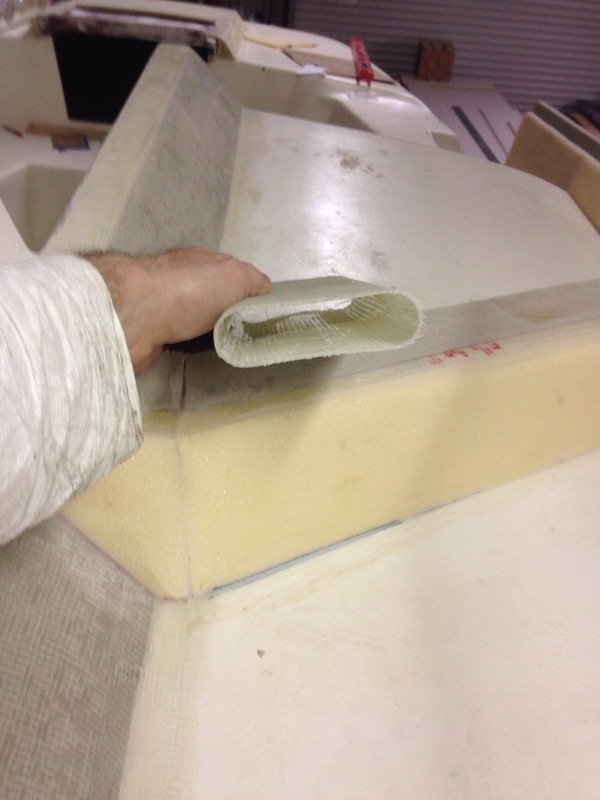 The rudder took shape nicely and has now gone thru the carbon lamination steps. Each side got a staggered 14 layers staring from the top down. 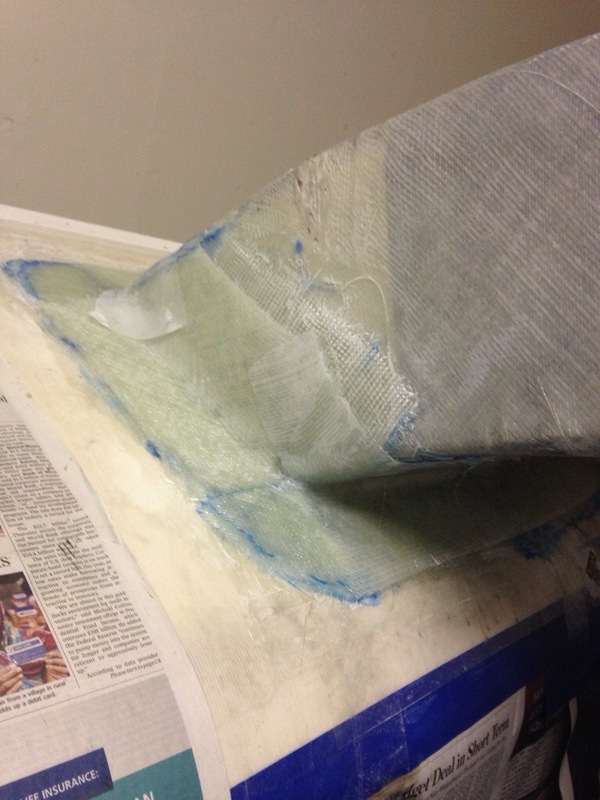 There’s some extra wraps over the upper edges, and the outer skin of the second side went in the vac bag this evening. 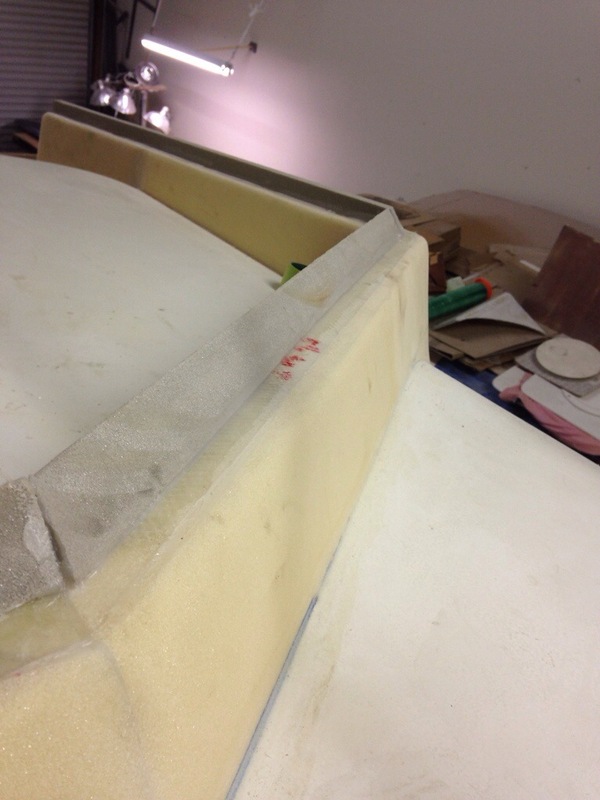 The last step will be adding a bit of Kevlar tomorrow to the leading edge, just to provide some impact resistance. 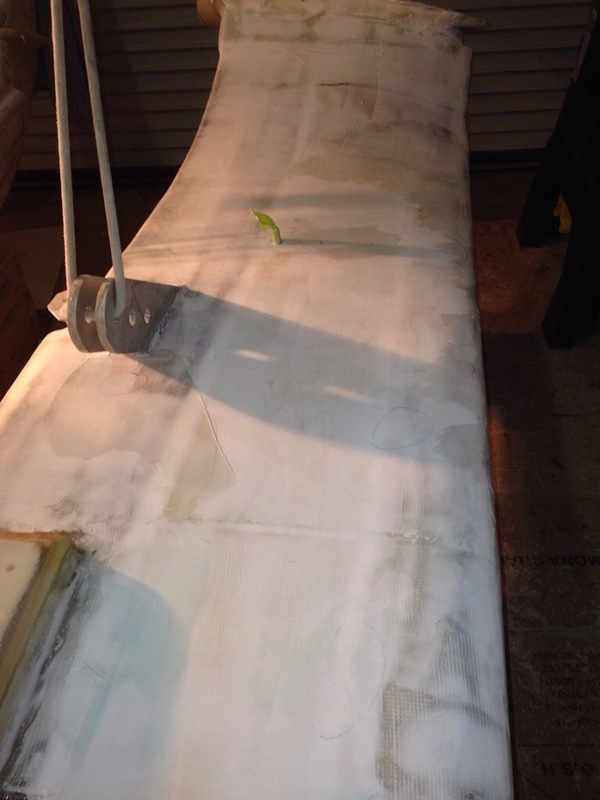 After waxing the mold, we made three trips around with wet fiberglass and let dry overnight. 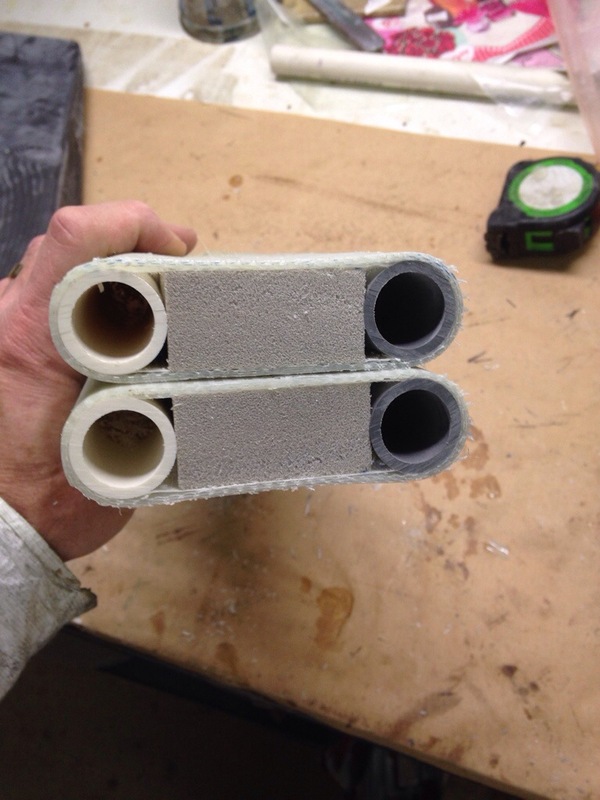 Cut it in half the next day and pop out the molds from each 12″ piece (that’s the step in the photo). I need to take a winch to the shop and mock up all the exact positions for these line guides, then we can cut the windshield frame openings to match and glass these tunnels in. And here you can see the decision on how to affix the removable windshield to its base. Bolts will go in horizontally along this grey wedge that has been set at the proper angles desired for each window pane going around the frame. Well, not exactly dancing in the workshop, but we did make a drilling jig today and got very nice results with the net lashing points on the beam edges. 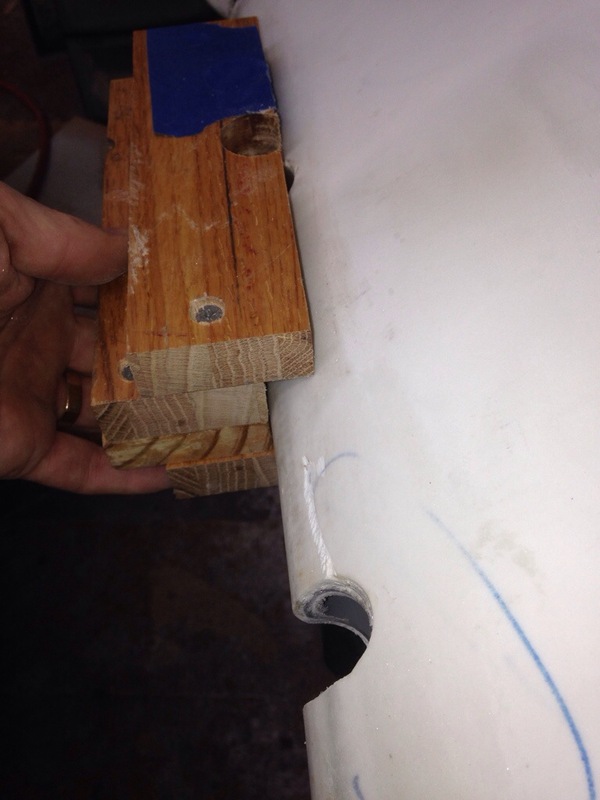 These slots cut in to the long tubes will allow us to loop small lashing line around a skinny rod inside the big tube, creating anchor points for the nets every seven inches along the beams, the float decks, and along the sides of the main hull. The drilling jig is simply some hardwood pieces screwed together and carefully drill pressed. It’s enough to get the pilot bit started on the actual work surface, then set the jig aside and finish each cut. These were cut using a one-inch hole saw (the wood-cutting version burned up quickly – needed to upgrade for metal-cut bits). The outer edges point in, following the circle, so another straight cut is needed next. Note the little paper pattern in this photo – that got marked on each hole with about 35 degree legs so the lashing line can run out at angles and not rub. Got both leading edges of the two being-worked beams done. Next is some fine-finish work around these cuts and two of the beams will finally be complete. 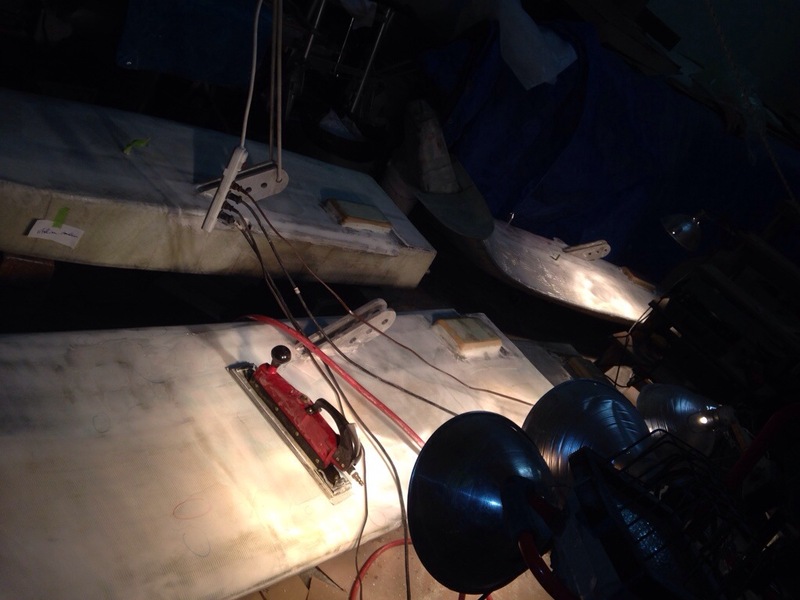 And while glue was drying – back to the hatches. Decided to beef up the locking area (it’s also the grab handle) with sturdy aluminum plates. That’s another pound or so added to the boat, but intruder security is the one place we don’t mind taking a small hit on performance wise. It’s a safe house before it’s a race boat. 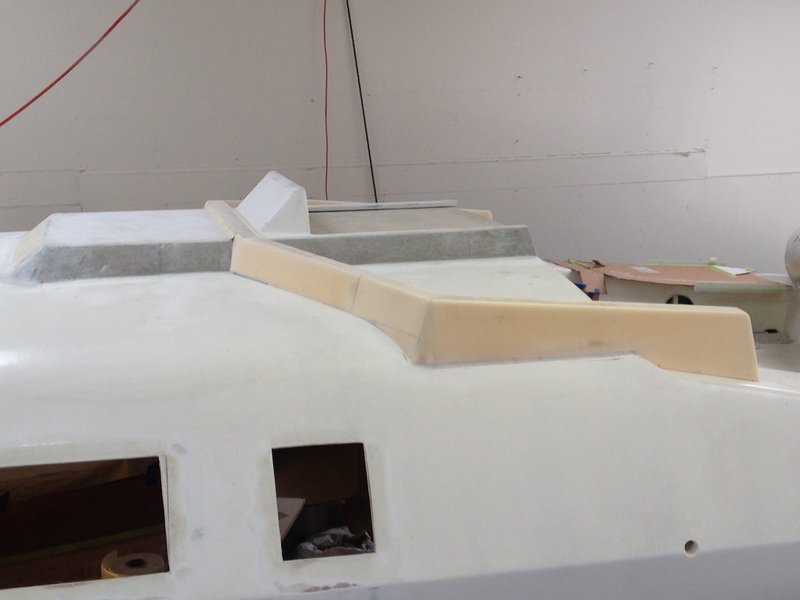 The windshield base is now complete, and it’s a little scary to be changing the look of the boat this much. We REALLY want a nice protective wind and wave screen, and it seems to make a lot of sense to have this with a removable top. Kind of like a little roadster car, where the winter hard top can be left home in the garage during the sunny weather. Back in fairing land, the first two beams are getting close. This thing actually looks like the right overall shape now. A skim-coat went on last night, so tomorrow’s sanding should be all about ‘finding final level’. With the other two beams down at floor level, I figured it was a good time to add the final two glass layers that tie the fairings to the inner end piece. After having just read Henny’s account of a very frustrating vacuum bag leak chasing on his major hull infusion job, I was feeling happy and smug about our ‘bagging’ success so far. Pride can be a nasty thing, as I was treated to a horrid Saturday evening of leak chasing! 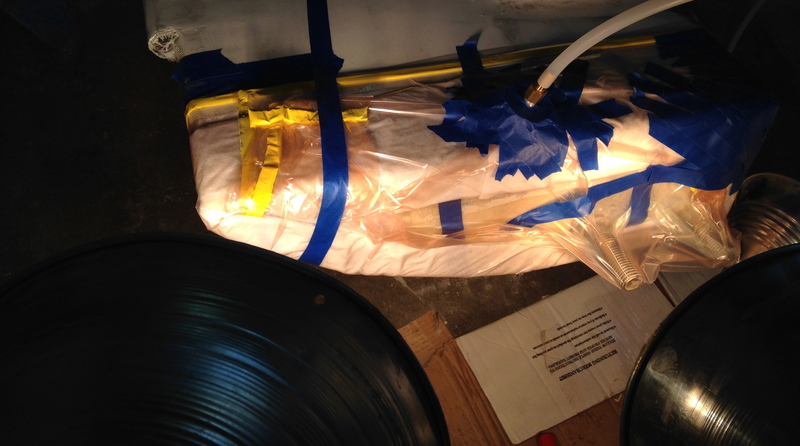 This little bag isn’t pretty, but the ridiculous part is all the blue tape… that’s operator error thinking he was hearing leaks along the yellow sticky tape line, and then the vacuum plug joint. There were actually two of these bags, set up with a t-fitting over to the pump. The pictured one would not get past -8 mercury inches, and the other one only -4 (-20 to -25 is my preference). After about an hour and a half of cursing and messing with tape, I came to the realization that air was probably being sucked thru the unfaired portion of the glass weave where the wave deflecting fairing joins the main square beam – if I had waited to do this operation until all the weave had been filled in, this would have likely been a 10 minute, ‘just fine’ operation. Argh. And of course after rolling around on the floor all that time, it was time to check the vacuum pump. Big problem there as many ounces of pump oil had blown out the exhaust hole. This new $400 pump has blown some oil on each of its first five runs, but it gets worse each time. 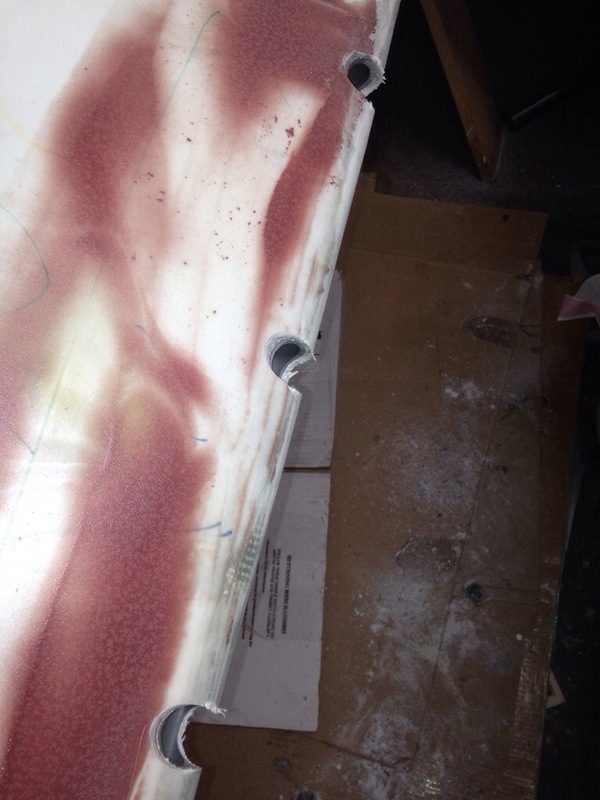 Really hoping Fiberglass Supply will come thru with warranty support tomorrow. Time to take a Sunday break and go watch the Super Bowl commercials (and lick wounds over no 49ers). 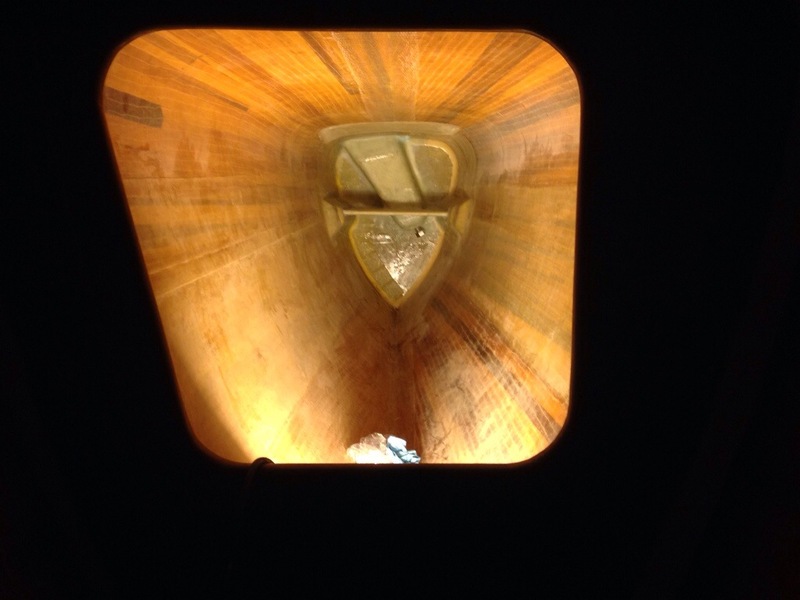 Lots of boat builders complain about the “fairing” work. This is the part where all the imperfections of roughing-in construction have to be smoothed out to get a perfect finish. 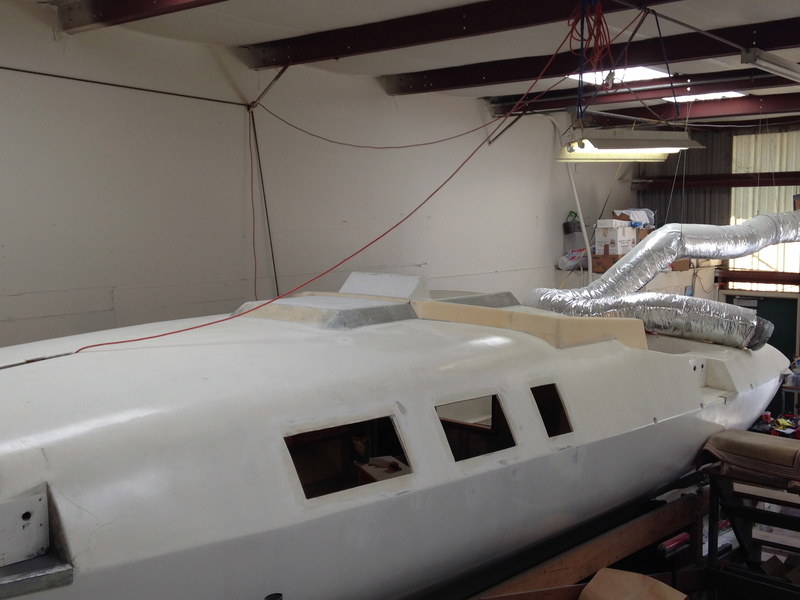 In a factory setting, great care is taken to “fair” the finish inside a mold where new parts like a boat deck will be made repeatedly. In a one-off custom build, I have to do the same work, but it’s done on each part as we go. 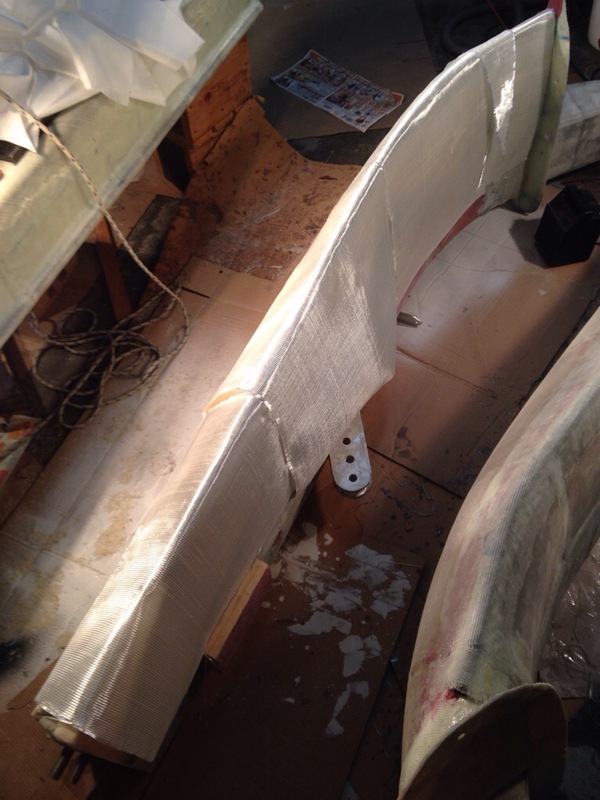 The 4 big beams looked pretty ugly before fairing began – the courseness of overlapping heavy 17oz fiberglass fabric, and some struggles with smoothly seaming the compound curves of the front splash diverters, etc all add up to lots of fairing work. Everyone advises to put time in to smoothing out the core surfaces before laying final glass layers; there were a few places I didn’t do that enough, and I’m paying for it now with extra fairing work. Figured it made sense to start on the BOTTOMS where no one but the fish and curious kayaker will see – a good place to learn this skill. Of course the shop is now a big mess with little room to move. Time wise it’s good to have them all going because there are long intervals where the fairing compound has to harden before the next sanding. Here’s one at the beginning; white compound is spread on with a notched trowel, then sanded back with a longboard to find level/even planes. The dark red sander is our first air compressor driven tool – an 18″ long sander for auto body shops; works well for this too. 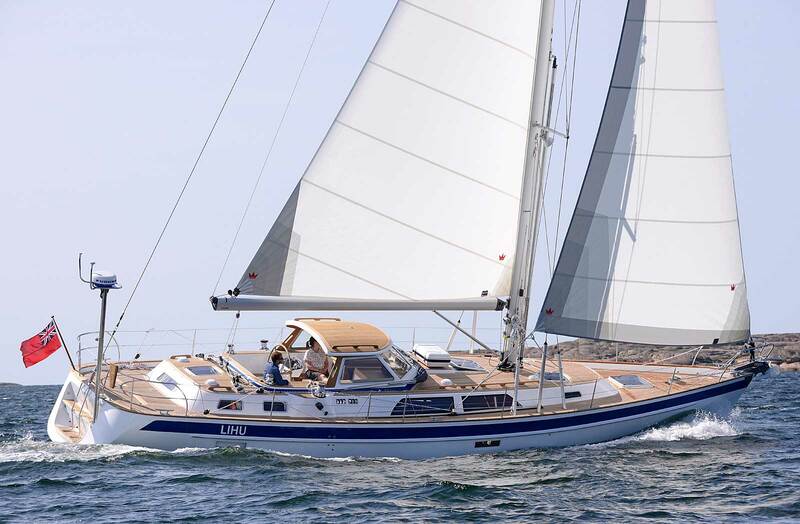 And a quick congrats to Rick Waltonsmith on recent upgrades to Corsair 37 Transit of Venus as he gets her ready for the Pacific Cup race to Hawaii this summer. 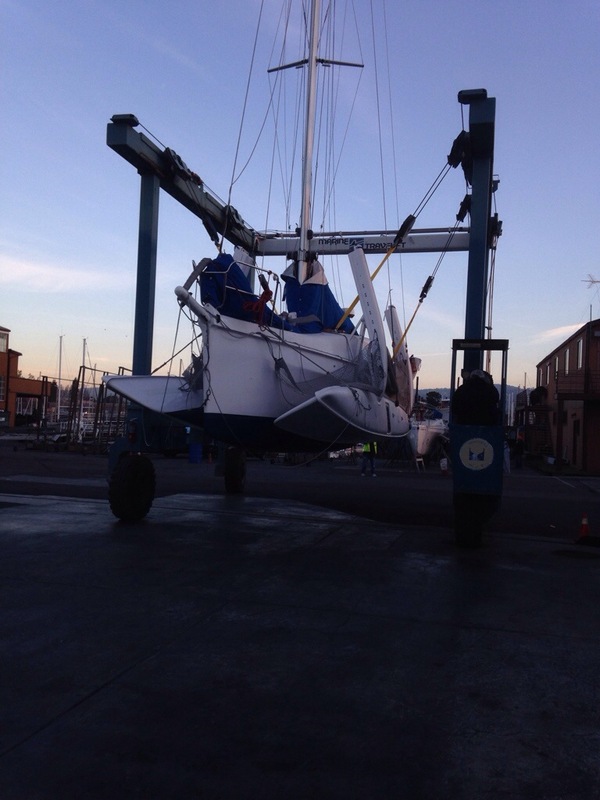 Yesterday we watched as Swensunds yard put her back in the water after a nice bottom job. 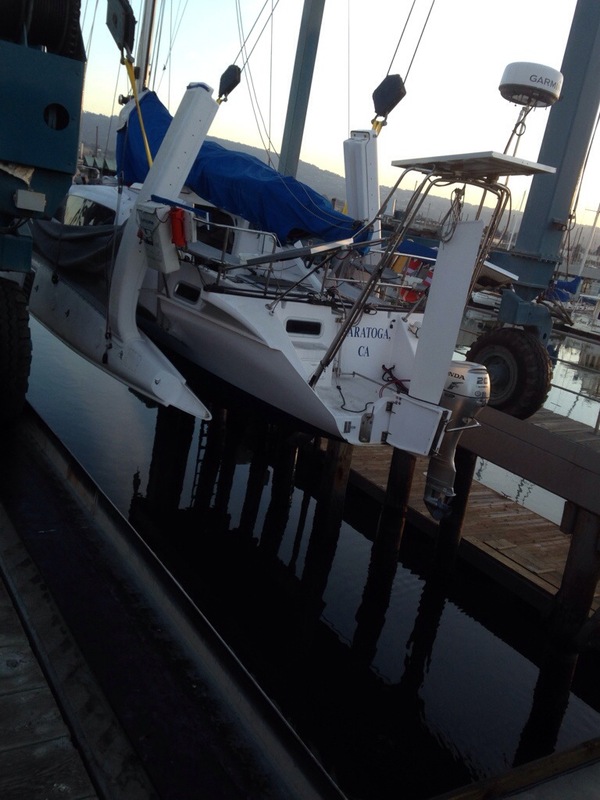 Just to be clear, our boat won’t fold up like that – we’d have to take the beams completely off to make things trailer ready. Anyway, it was a great afternoon sailing TOV on the Estuary, testing out her big Code Zero and carbon main. She’s all rigged up to GO FAST! But the big “wrap” is saying goodbye this Friday to my dear colleagues at Ryan/Epsilon. 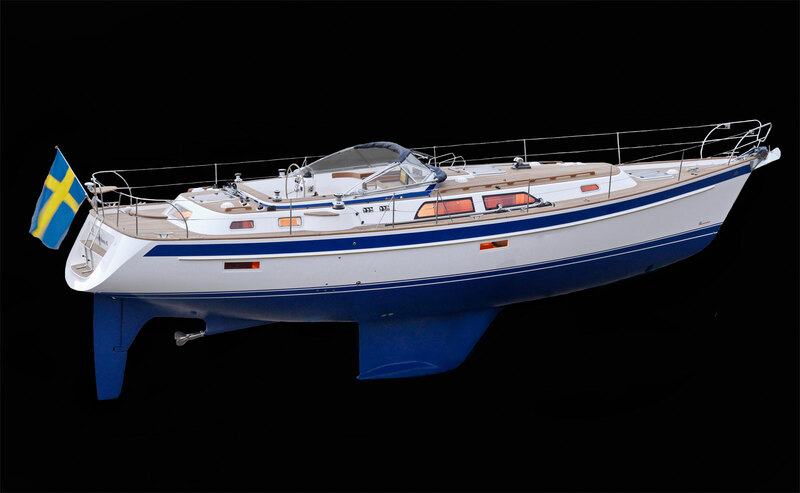 I’ve hit the 30 year mark in corporate marketing, and realized this boat needs a full time builder to get her launched in 2014. So, welcome to the new blog followers who are kinda pissed at me for leaving the San Fran office but are happy to have reserved themselves crew positions aboard 005 :). Let’s just say things are really going to heat up in the boat shop now and we’ll all start seeing more interesting progress reports. While the actual crossbeams are complex, 100+ pound structures, they make up only 10 inches (looking down on them) across what will be finished 2 ft wide beams. The rest of the width comes a 5 pound ‘fairing’ made of foam core with one layer of glass inside and out. I showed them being built in their frames early this year. 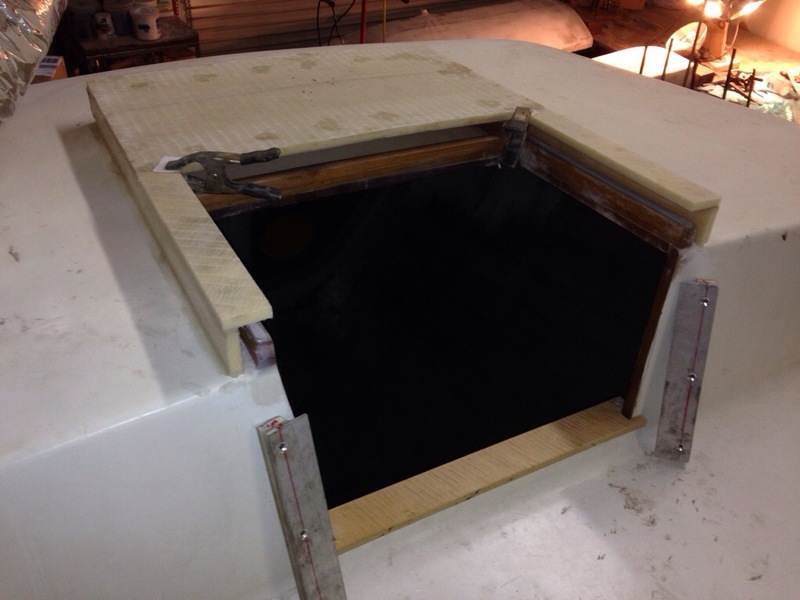 Here’s one of them with the access holes cut – that’s how we reach inside to glass them to the solid structure. Now that they’re installed, those holes will get filled back in this weekend. 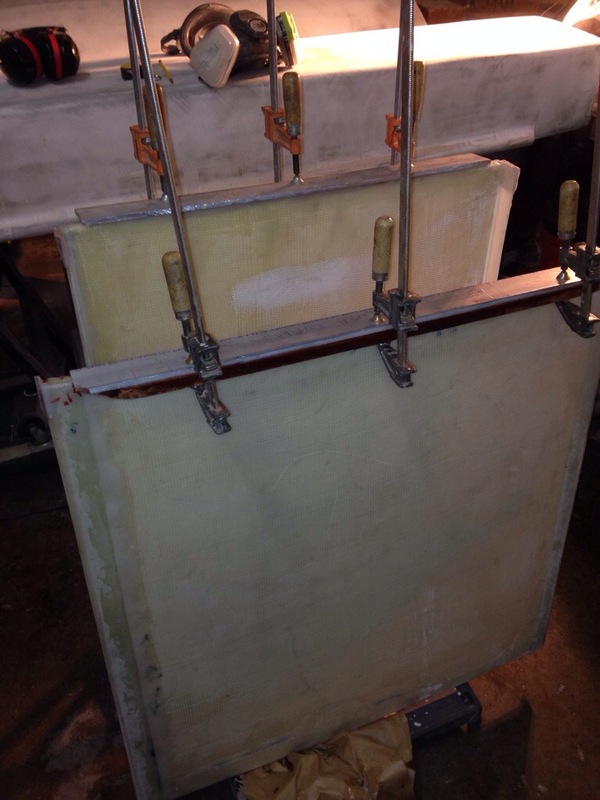 The silver and white panel in the background is the final panel of the refrigerator cabinet, the side where the cold plate mounts. 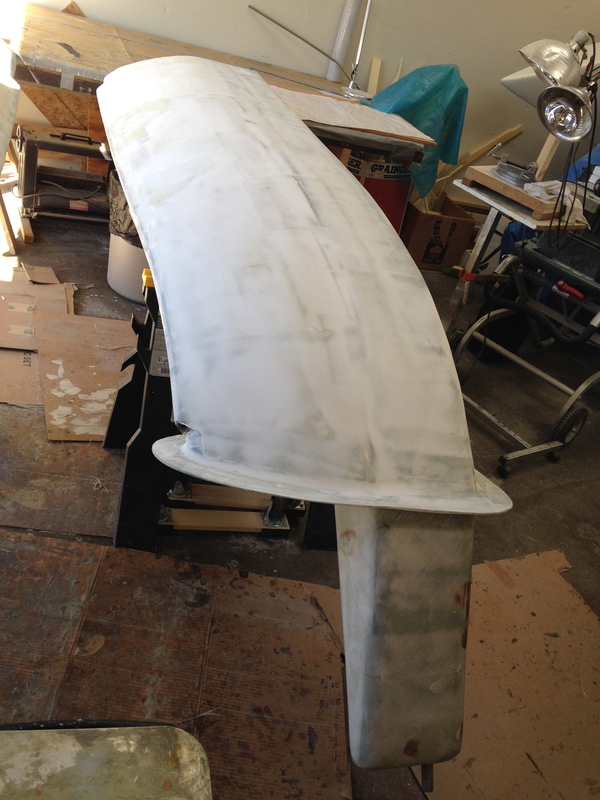 After the fairings go on, the completed beams get flanges formed. 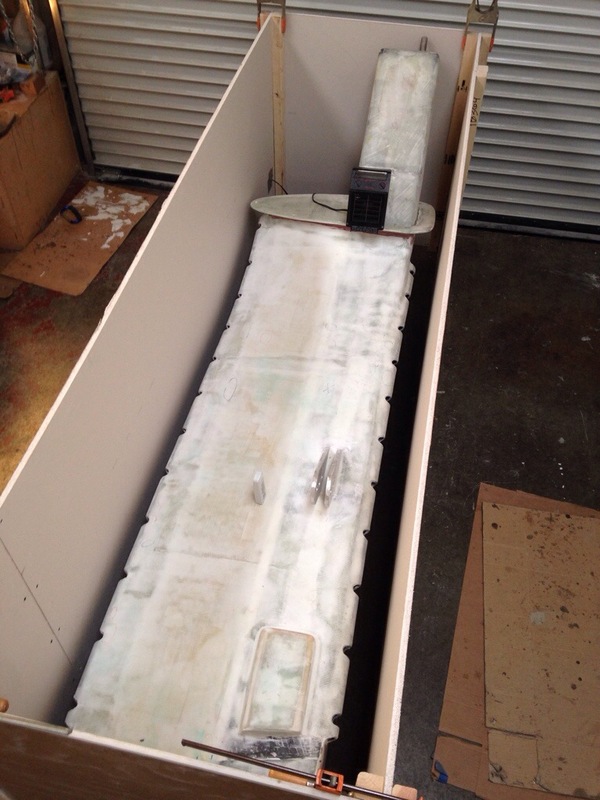 This is where bolts will go to hold the beam to the float. 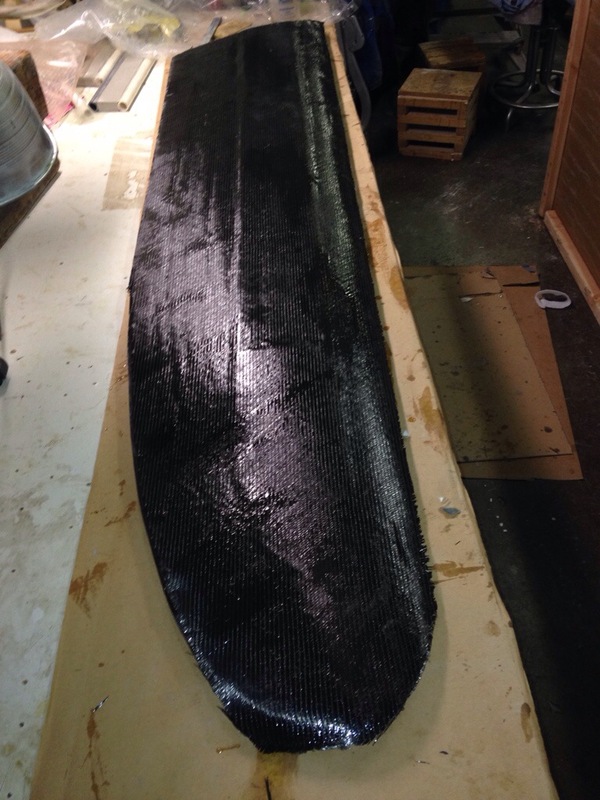 In the photo you might be able to see the plastic non-stick that’s on the float deck. 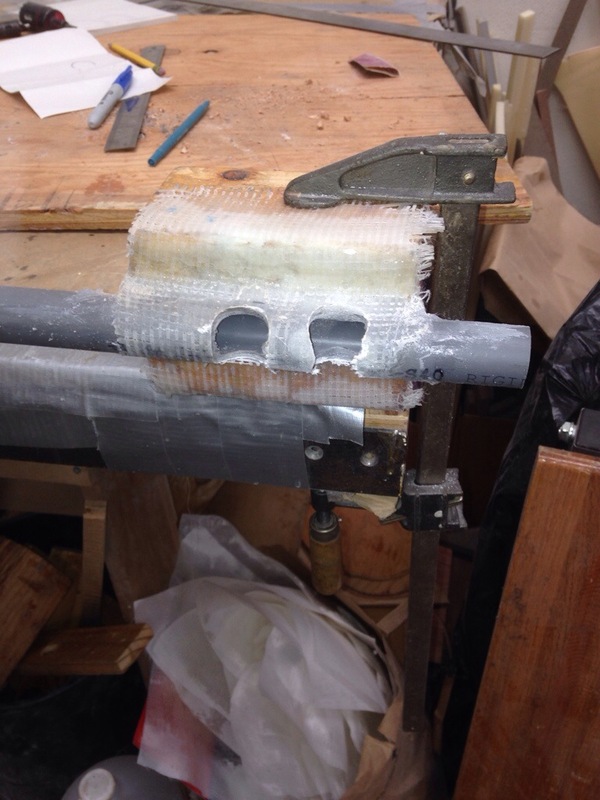 The Fiberglas flanges are formed in place, adhered to the beam but will pop right off the deck when we lower the float back to the floor. The port side beams are being fitted in to the float now. Since all the steps are being repeated from the other side, things are going much faster. 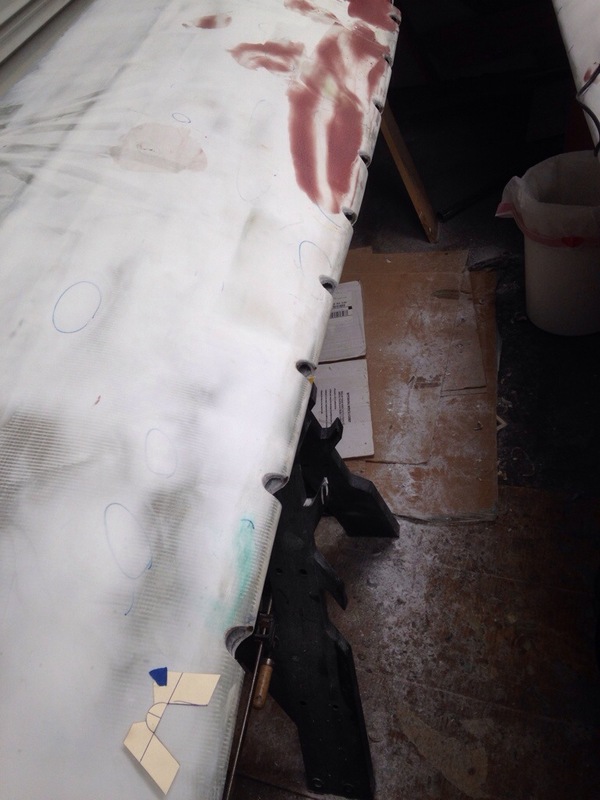 One example is cutting the glass fabric and applying the epoxy out on the work table. 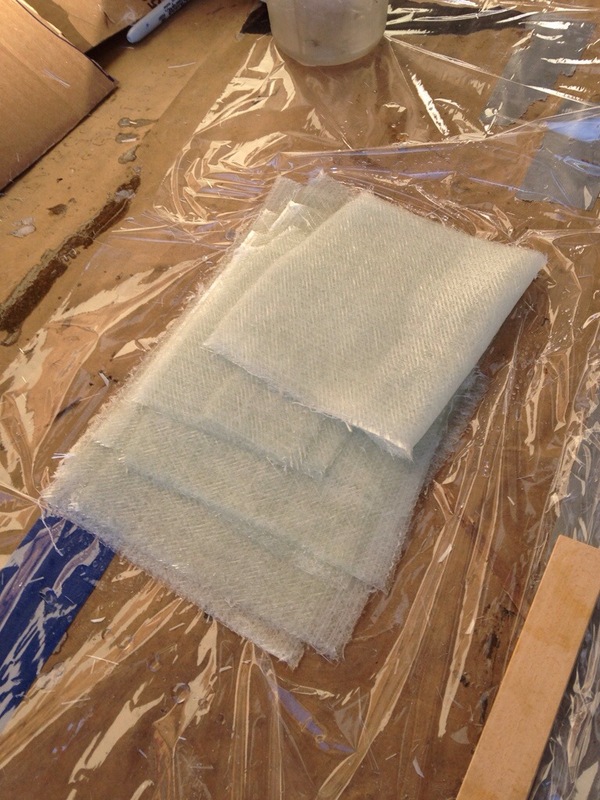 Once all the pieces are wetted out, they get tucked in to the plastic wrap for transport inside the float. Kind of like a nicely prepared take out meal, ready for the picnic. Yesterday’s work was installing the cross-float webs (shelves) on each side of the bulkheads that bisect the float sleeves. All of this structure gives the beam-to-float connection a lot all-direction support. You can see the beam’ end bolt exiting the sleeve, and the big nut that snugs it all together. I ended the weekend by unpacking the new refrigerator unit and test fitting the cold plate in the fridge box. It’s all coming together nicely, and the low energy draw of the CoolBlue system, plus thick walls, should keep the power draw down in the range for solar-only management. 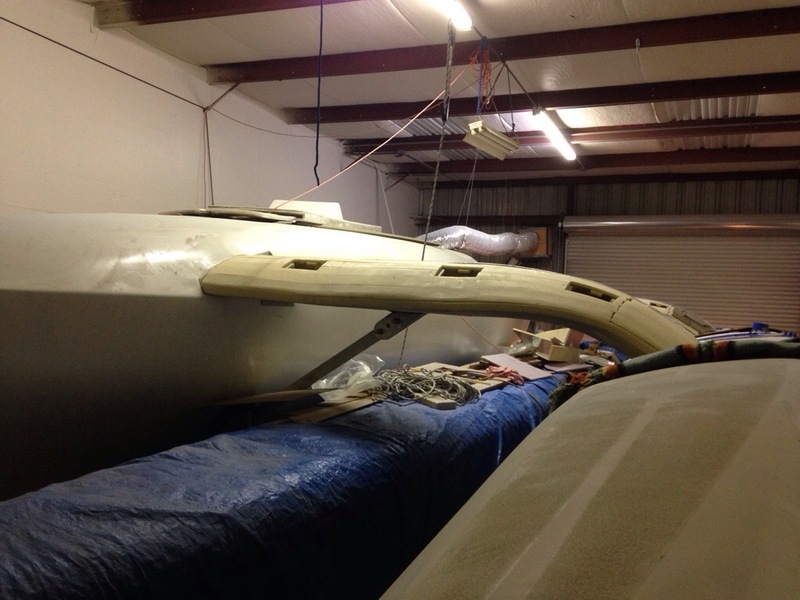 Now it’s on to installing the port side beam fairings. More pics in a few days.